A conversation on a dating app ended with a guilty plea and fines for an Oklahoma woman, according to an Oklahoma Game Wardens Facebook post. An Oklahoma woman looking for love got more than she bargained for when she unwittingly shared her exhilaration about illegally shooting a "bigo buck" on a dating app with a state game warden. 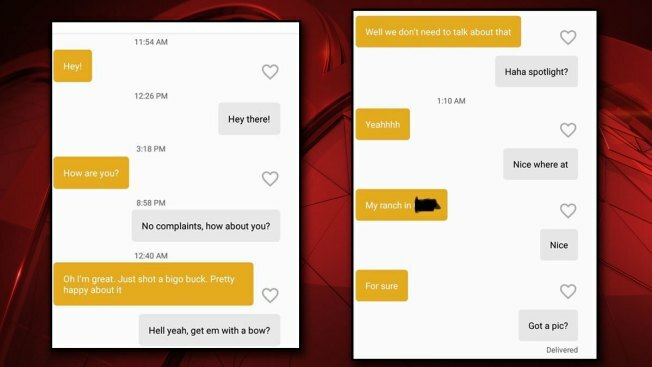 Game Warden Cannon Harrison, of McIntosh County, learned of the poaching in a conversation with a woman on the app Bumble, according to a post on the agency's Facebook page, which included screenshots of their chat. The woman talked about using a spotlight to shoot the deer at night, which is illegal in Oklahoma. When Harrison asked if she shot the buck with a bow, she responded, "Well we don't need to talk about that." It is not clear from the post when the exchange took place, but the screenshots of the conversation were posted to Facebook Jan. 6. Deer gun season in the Sooner State runs from Nov. 17 to Dec. 2, according to the hunting guide from the Oklahoma Department of Wildlife Conservation. Deer archery season runs from Oct. 1 through Jan. 15. What's more, the woman only harvested the head and back-strap meat, also illegal, and she sent Harrison pictures as proof. Game wardens went to her property and made the "illegal deer case." The agency said the woman pleaded guilty to charges of improper possession of an illegally taken animal and taking game out-of-season. She was also fined deerly for the incident.